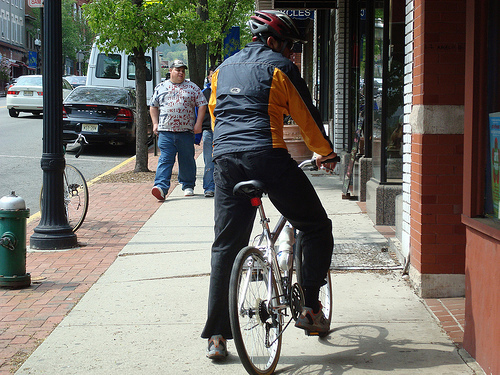 “Walkability and bikability” audits have been completed for Winston-Salem and Forsyth County. The audits showed that destinations such as schools, libraries, shopping and other community facilities are within walking distance (1/4 mile) of only 20% of neighborhoods and less than that in low-income neighborhoods. The audits also pointed out that ample street calming measures are in less than 20% of neighborhoods, and that a continuous network of biking routes exists within only 20% of neighborhoods. A “Walk Score” measures the walkability of any area and how easy it is to live with fewer car trips in that area. Winston-Salem received an average Walk Score of 35 out of 100 for rankings done nationwide. For the smaller municipalities, scores were: Kernersville 37; Clemmons 23; and Lewisville 20. This compares to a Walk Score of 75 for Boone, 51 for Asheville, 39 for Charlotte, 48 for Wilmington and 53 for Chapel Hill. Walking and biking to destinations is facilitated by the construction of Complete Streets, retrofitting existing streets, improving street connectivity, creating livable streets and employing traffic calming. All of these topics are discussed in detail in Chapter 5,Transportation.